MB Labs is a group of artists, designers, and engineers who help create unique interactive products. Our team is truly passionate about making jaw dropping interactive installations. If you're looking for something truly unique we'd love to cook something up just for you. Let us help turn your idea into a tangible product, bring our unique creative approach to your concept. Leverage our network of domestic and international manufacturers to bring your product into the world. 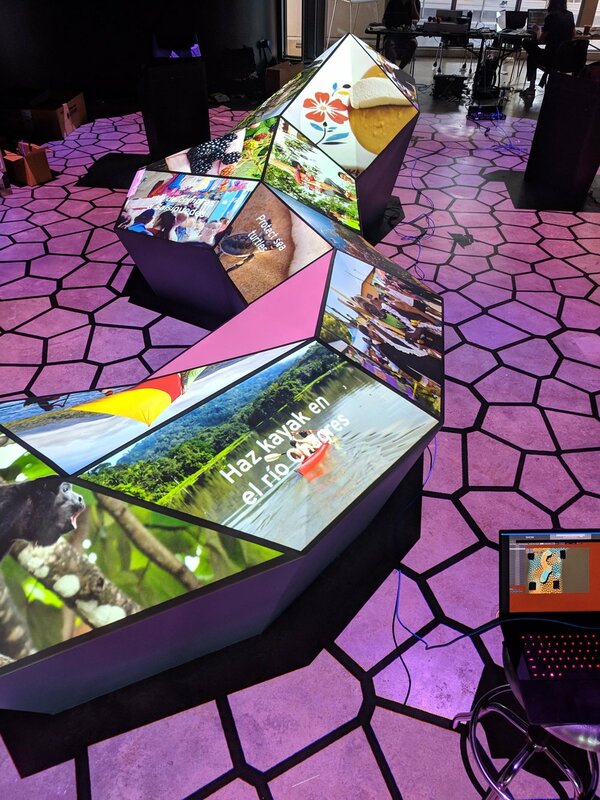 A new perminant exhibit opening at the Biomuseo in Panama was made in partnership with Tellart. MB Labs was responsible for the entire software system integrating with 25 projectors, trackers and kiosks around the space. All of the content was loaded by the client through a custom CMS and synchronized between all of the server computers. Red Bull's yearly challenge event may sound grueling to some: a 72 hours spent hacking away at a piece of art with little to no sleep. For us, it's better than a vacation. For the 2013 Red Bull Challenge qualifier the team built a six foot robotic arm that spins around a phosphorescent canvas. As the arm moves across the canvas ultraviolet LEDs flash on and off to burn a temporary glow in the dark image onto the canvas. A website allows the public to send drawings or images to the arm in real time. These experiments in table based multitouch interfaces are based on the TUIO protocol using Community Core Vision as it's tracker application. Because the TUIO protocol is based on OSC (Open Sound Control), an emerging standard for interactive environments, it can be easily implemented on any platform that supports OSC. This enables us to pull from an array of client resources including Java, C , Max/MSP, Processing, Python, OpenFrameworks, and even Flash. This allows for assembly of the right combination of implementations appropriate for any project. PlantLink is a soil moisture sensor system that lets you monitor your garden. Thirsty plants are able to ping their owners via Push, SMS, or Email. PlantLink felt they would benefit by introducing a native iOS application and turned to our team to do the job. We were able to quickly integrate with their existing team, beta test with their users, and deploy a native iOS application in the App Store. If you've ever fallen ill after eating at a restaurant then you can understand the importance of a product like MobileTherm. With the MobileTherm hardware installed restaurants are able to monitor their cooler's temperatures in real time. At the first hint of an over temperature event or power outage the device utilizes its cellular network connection to send push notifications to the companion iOS app and via SMS. For Red Bull's 2012 Challenge the MB Labs team created Morphield, a game table the moves the field instead of the players directly. Using 125 balloons and solenoids, 200 feet of pneumatic hose, 400 feet of wiring, and 1,500 solder points the MB Labs team put this creation together live in 72 hours.